The glitz, the glam, the hair! The 71st Golden Globe awards were held on January 12th at the Beverly Hilton Hotel and the hotel was packed with A-list celebs, stunning gowns, plenty of wine, and fabulous hairstyles. It was clear at the Golden Globes that a sleek and chic long bob haircut is both vogue and captivating and celebs like Reese Witherspoon, Emma Stone, Diane Keaton, and Giuliana Rancic looked amazing with their bob hairdo’s. However, there was plenty of versatility at the Golden Globes and these are our top 10 favorite hairstyles from the 2014 Golden Globes. 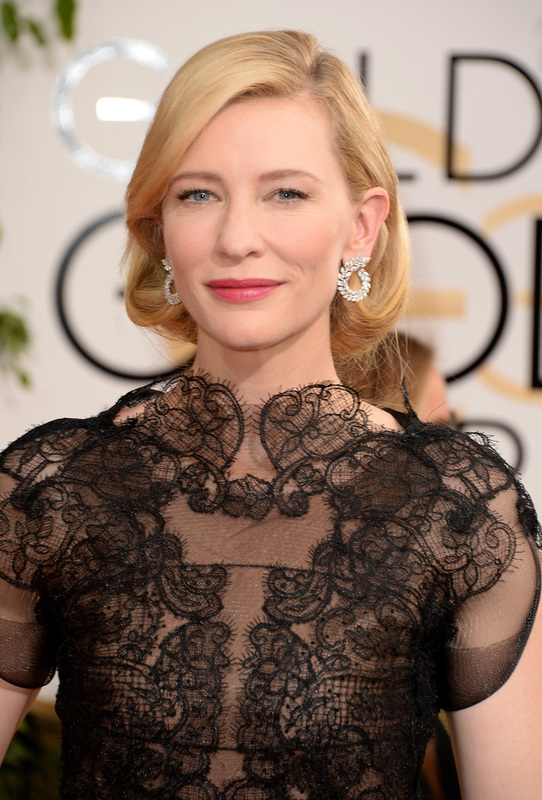 Chic bob hairstyles were the biggest trend at the 2014 Golden Globes. Taylor Swift radiated glam in her red and black color blocked dress, styled with soft old Hollywood glam curls that were pinned up and with perfectly styled side-swept bangs. Taylor Swift turned heads with her Golden Globe timeless hairstyle. Cate was a red-carpet favorite and she looked absolutely jaw-dropped and embodied regal with her entire look. Her hair was styled for simplicity and the soft under curls went perfectly with the collar of her dress and her statement making earrings. Cate Blanchett was one of the best dressed of the night. Zooey Deschanel is always super charming and she doesn’t disappoint at the Golden Globes. Her hair was swept to one side in a low side bun and it looked perfect with her dress and her captivating personality. Zooey Deschanel always looks cute and charming. This Golden Globe nominee embodied classic beauty with her floral embellished gown and curled loose updo. A soft and sweet updo was perfect on Sally Hawkins. Hayden’s slicked back hairstyle looked amazing with her monochrome gown. Hayden Paniettiere with a slicked back bob hairstyle. The host of Access Hollywood looked amazing in her cobalt blue gown with a high slit. Her down hairstyle was the perfect choice for the strapless neckline. Shaun Robinson wavy lob was jaw-dropping with her strapless gown. It’s hard to choose who looked better: Camilla Alves or hubby Matthew McConaughey. This A-list couple looked like the ultimate glam couple on the red carpet and Camilla Alves long soft wavy hair looked impeccable. Camilla Alves has gorgeous long flowing wavy locks. Modern Family star Julie Bowen said she would do anything for a nomination from the Hollywood Foreign Press but she rocks the red carpet like a winner. Although some people have criticized her red velvet dress on the red carpet, her center parted and twisted updo is amazing. Modern Family star wore a gorgeous twisted up do with red velvet. This Australian-beauty and leading lady in the hit movie The Wolf of Wall Street stunned at the Golden Globes in her jeweled white gown. Her soft side-swept updo was simple enough to show off her accessories and gorgeous gown but also extremely elegant. Margot Robbie wears an amazing low-bun hairstyle. TV personality Rocsi Diaz looked amazing in her long and glamorous Golden Globes gown. Her hairstyle was a soft updo and it looked flawless. Rosci Diaz wore a stunning updo to the Golden Globes.